The Kyiv prosecutor's office has declared several individuals who attacked MP Mustafa Nayyem suspects in a criminal case. On 30 April, Nayyem got beaten in central Kyiv over a motorway dispute. The MP apparently did not let another car cut in front of him as he believed it was snubbing the traffic rules. "Three participants in the conflict, who are involved in the attack on the MP, have been detained under Article 208 of the Criminal Procedural Code of Ukraine. They were born in 1999 and 1996. Two of them are Russian nationals and are staying in Ukraine on temporary residence permits, the other one is a Ukrainian national," the press service of the prosecutor's office said on Facebook. They were declared suspects under Article 296 Part 2 (hooliganism by a group of people). Their Mercedes Benz G-Wagen was confiscated and impounded. The fourth person who hit the MP in the face was declared a suspect under Article 296 Part 2 and Article 122 Part 1 of the Criminal Code (deliberate medium-gravity bodily injury). Police are searching for him. 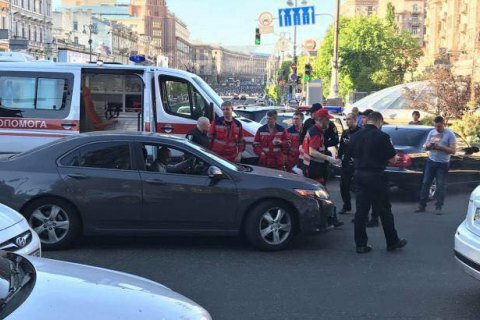 Later on 1 May, Nayyem said on Facebook that the fourth person, who actually attacked him and seemed to be in charge of the group, managed to flee to Baku by plane although police had identified him. "Several people in various institutions have already been contacted with an offer of a settlement – to sweep the case under the carpet, to release the guys and let it all go. I sincerely hope that investigators and prosecutors are playing on the side of law, not those of settlers," he said. According to Masi Nayyem, as a result of the brawl, his brother Mustafa had a brain concussion and a broken jaw.